DressageMarket.com is an online outlet related to everything dressage. It was created to give users an affordable, easy and effective channel to connect and advertise to dressage enthusiasts. Horses, businesses and tack/equipment are advertised through listings. 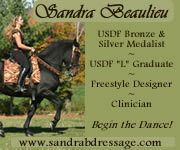 Additionally, there is the option of advertising through banner advertisements on DressageMarket.com and through our newsletters that reach over 7,500 dressage enthusiasts. New listings are added daily and existing listings are commonly updated, since users have 24/7 access to make updates. There is always a good selection of horses for sale that range from young horses to proven Grand Prix horses and from Hanoverians to Quarter horses and beyond. Our Directory has an assortment of businesses including: artists, barns, breeders, trainers, vendors, etc. Dressage Market has been online for 3 years and continues to expand by adding new functionality to the website and also by improving current features. We take pride in giving users a website that meets or exceeds their needs and enjoy receiving feedback. If you have a suggestion, please click here to contact us.